There’s something I’ve been thinking about for a few weeks now. I want a cleaner house this year. We’re about to close on a home, a first for my husband and me. It feels huge. The house we’re buying is currently inhabited by a retired couple from Australia. There are no kids there, but the walls are decorated with the pictures of young grandchildren. This house has been babied. It’s been immaculately cared for. It was the only house we toured that looked better in person than in the listing pics (that never happens!). It was warm and homey, not stuffy, but immaculate nonetheless. I want my house to stay looking like that. It’s not easy keeping the house clean when you have a large family, people. I could throw out a bunch of cutesy memes here, like the one about cleaning house with young kids being akin to shoveling snow in a blizzard. But it’s true. I’m one person, fighting the dirt and clutter and detritus for 9. The problem isn’t that we’re dirty people. We all clean. The kids do their chores. “Babe, we literally have 350% more kids than everyone we know.” or somesuch would usually be the answer. Our 350% more kids are also home most of the day. They’re not in school or day care, places that employ people full-time to keep things clean. It makes a big difference. In order to figure out how to keep a cleaner house, I did what I always do when faced with a conundrum: I read a stack of books. I take the view that problems are usually a systems failure, not a people failure. It’s time for better systems. I sat my family down and explained that the problem was that I was spending too much time tidying messes. By the time I got around to doing actual cleaning, I was too tired or out of time. So the weekly/monthly tasks that make a home look bright and shiny (cleaning windows, dusting baseboards) just don’t get done. I’m spending too much cleaning time in crisis mode. I’ve tried making weekly and monthly chore lists and trying to follow a schedule, but that simply isn’t working anymore. Again, it’s a time/energy issue, not a lack of organization. I’ve learned a lot about motivating people (including myself) from reading books on economics. Odd but true. 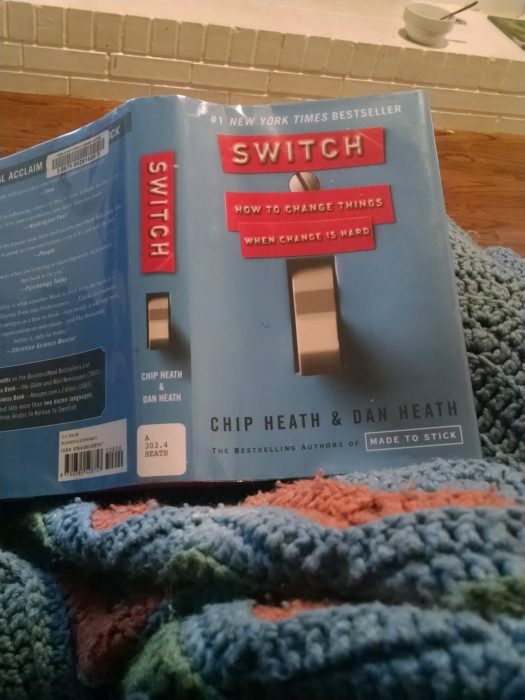 I recently re-read Switch , and it reminded me of the metaphor of the Rider and the Elephant, which refer to the logical mind and the emotional one. How could I get to the Elephants? I need to get my family to FEEL something. Trying to tell the Riders what to do with logic (“these are the rules, and these are the consequences” blahblahblah) is not sustainable or effective. Firstly, I had to make them feel part of the process. When people feel in control, they are more likely to take ownership and have pride in something. I remembered the lessons I learned in Start With Why . Why are we doing this? What is the end goal? This is a great way to motivate people: tie unpleasant tasks to a greater goal or value system. Our why is because we want to be proud of our home and we want to be more spontaneously hospitable. As a family, we have a goal to have someone over for dinner once a month. But none of us is going to feel comfortable inviting someone over unless the house is clean. I got some great suggestions from the kids. 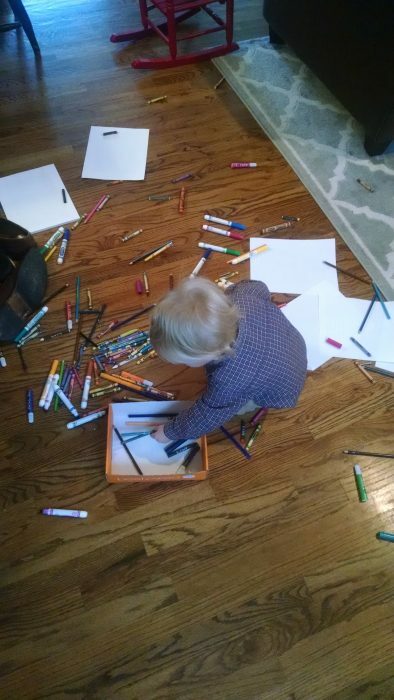 How did the toddler get into the box of art materials I keep on top of the bookcase? I have no idea. I also involved my husband. It may or may not have included a stressed-out tired rant, a glass of wine, and a very patient man. After explaining the problem as clearly as I could (that it’s not possible for one person to clean up after 9 unless that person does so full-time, and I’m not a janitor who gets a paycheck, etc), he make an excellent suggestion: that we do an after-meal cleanup, ALL of us. The previous routine was that I would spend an hour cooking a delicious, nutritious, well-thought-out meal, only to watch everyone gulp down their food, leaving the table and me with the mess. 9 people can destroy a dining room, folks. And everyone but me seemed to have a sort of messblindness about it. I just coined that term. Like mind-blindness, but for messes. I define it as “a cognitive disorder where one is unable to see messes they’ve left behind.” Feel free to use it. You’re welcome. They would take their plates to the kitchen (mostly), but there would be a pile of crumbs at everyone’s spot on the table, chair and under the table, making it necessary to sweep the floor after every meal and snack. My floors, several times a day. Another problem? Multiple breakfast (and other meal) shifts. I’m out the door at 5 so I make my breakfast the night before (and clean up after myself) and take it with me. In the morning, hubby gets up and cooks for himself and the 3 littles. Then the big kids lumber into the kitchen, at staggered times typically, make their breakfast… and by the time the big kids are done eating, and I’ve cleaned up, the littles are ready for second breakfast, so the cycle begins all over again. 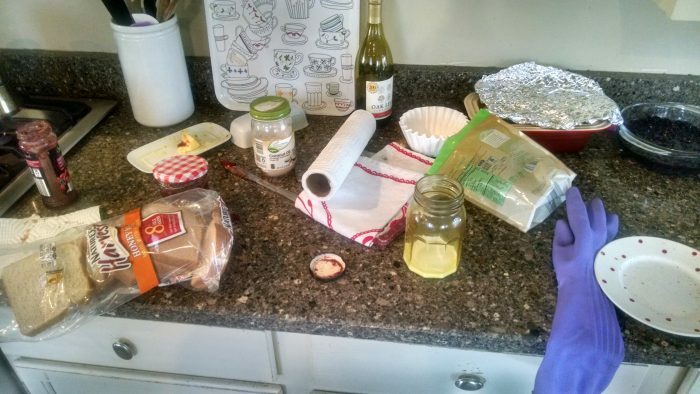 The counter after breakfast prep. It looked like this several times a day. Gretchen Rubin calls this “the tragedy of the commons” – an area everyone uses but no one takes responsibility for. This means that I was cleaning up a mess like the above 3 times before 9 am. That leads to a resentful mama. It also means I’m too worn out to mop the floor. They simply don’t SEE this mess, and so don’t clean it up. It just doesn’t register. Habits again. I have tried unsuccessfully to make my children only eat at meal times and designated snack times, comme une maman, but alas, that would only work if I lived in France and the entire culture was reinforcing that concept. It would help if my kitchen was at the end of a scary, dark hallway with doors on either side that could be locked, a la pied-à-terre. Another book I re-read recently was Don Aslett’s Is There Life After Housework? . I adore Don Aslett. You have to love a man who cleaned for a living and is honest about naming the problem; that women do 90% of the housework but men and kids make 90% of the messes. As a father of 6, he also knows what it’s like to clean up after them. My oldest son suggested that we go back to making overnight breakfasts again, something I used to do frequently. That combined with hubby’s after-meal quick tidy make a big difference. Funny thing is, because the idea came from the kids, they’ve been holding each other accountable. My 13-year-old daughter has been on fire these last couple of weeks. I’ve seen her take on multiple chores just because she saw they needed to be done. She’s also yelled at lovingly reminded her siblings of infractions. And, I also need to make some more rules. The walls around door frames look like this because of the 6-year-old’s climbing. Believe it or not, I had cleaned this wall the DAY BEFORE this pic was taken. This is one day’s worth of dirty feet prints. Now when my daughter starts climbing the walls, I send her outside or have her do a useful chore. I’m trying to change these habits before we move. To lay down the rails so they’re ingrained. A broken dishwasher provides plenty of useful work for the little girls. Another thing I did that will continue? Actual cleaning lessons. It occurred to me after reading Cleaning House that I hadn’t actually taught my kids the step-by-step process of cleaning a space. How ridiculous is that of me? Switch taught me that what looks like resistance is often a lack of clarity. I grabbed 3 of the older kids and showed them exactly how one can clean a bathroom in just 5 minutes (not including the tub/shower). They seemed impressed that it only takes that long, if one knows the tricks, to take out the trash, empty the hamper, clean the mirror, sink and toilet, and even sweep and mop. My children get allowances and are expected to do chores and keep their rooms clean, but I’m now going to stop doing laundry for anyone over age 8. “As long as I know they will get done at a certain time, then I can leave them alone”, I explained. So he agreed to two specific times per day. Problem solved. Another rule I am imposing now? We only eat and drink at the dining room table. 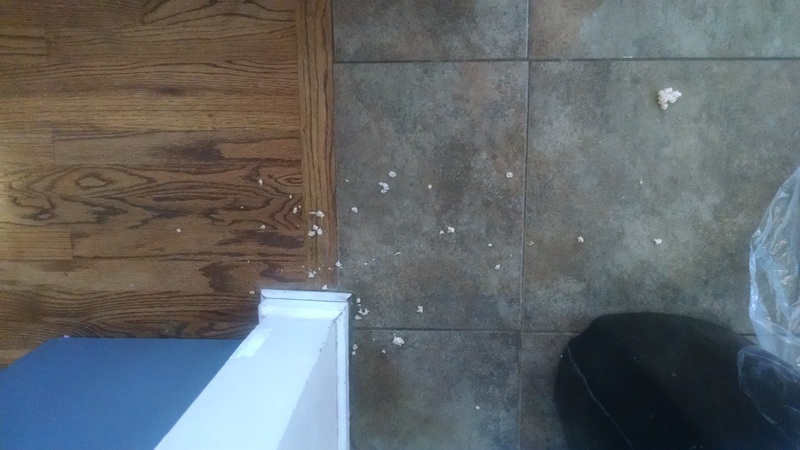 My family members are bad about carrying cups of tea and coffee all around the house, spilling them on the couch and rugs, and producing little drips of coffee and tea all over the walls, floors, and (white) stair risers. How does one get their beverage on the walls and stair risers? I have no clue. One day I scrubbed tea and coffee drips off the white stair risers, only to have them reappear the very next day, a Sisyphean effort if there ever was one. Instead of getting all naggy, I gave my husband (the major offender) my favorite Starbucks commuter mug so he had his very own that will keep his coffee HOT (and INSIDE the cup, but don’t tell him I said that). I had been trying unsuccessfully to get him to use a travel mug for a long time for several reasons, but now I think the habit will stick because I went about it so manipulatively deceptively nicely. One must lay down the rails. Lay. Down. The. Rails. In other words, make the behavior you desire easy. It’s hard sometimes not to become discouraged at what you feel should be obvious to anyone over the age of 3, but here’s the plain truth: it isn’t obvious to some. These concepts must be taught, especially to people who don’t rank high on the conscientiousness scale. 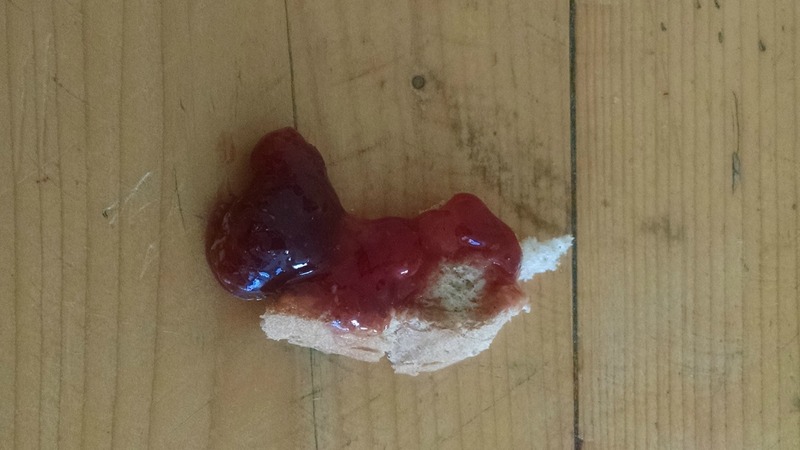 A random glop of jelly left on the table. Everyone wants to put their papers, books, arms down on a clean table, but nobody notices the glops, much less clean them up… except me. Putting hooks on doors so people will hang their jackets instead of throwing them on the floor. I plan on installing MANY hooks in the new house. Several spray bottles of cleaning product in each bathroom and kitchen so no one has to search for them. And paper towels. As much as it bothers my inner crunchy, it means more messes are cleaned up. Traffic control. Like I said, I won’t be allowing any food or beverage anywhere in the house except at the table. I should have enacted this years ago. I’m a little slow sometimes. p.s. If you’re getting ready to leave a comment telling me I should be thankful to clean up after a husband and kids, save it. I already know that. It’s an issue of managing my time and (limited) energy, not a lack of love and gratitude. 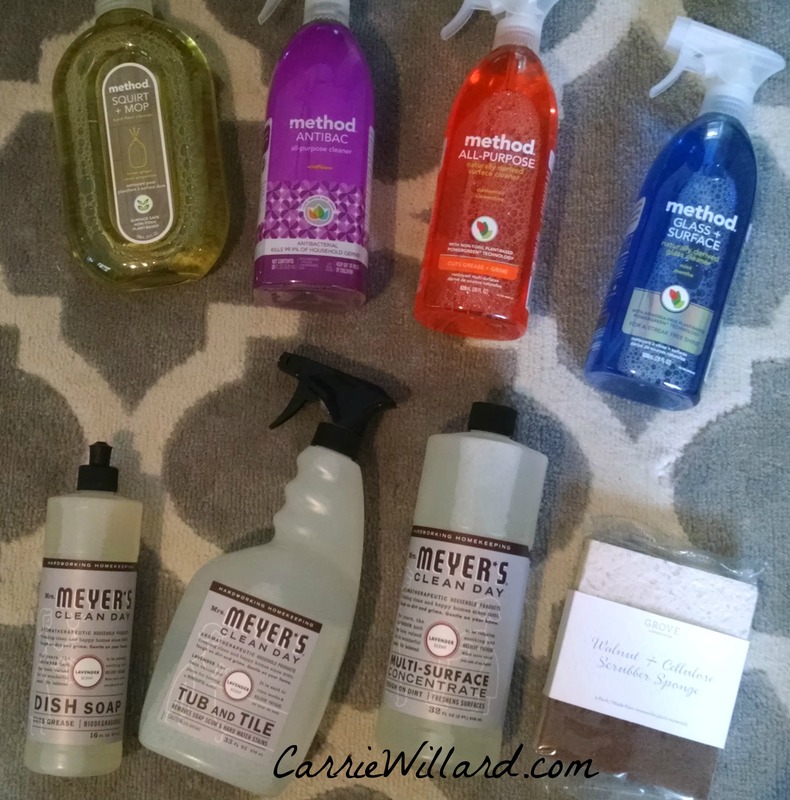 Do you have any tips on keeping a house cleaner with a lot of kids? Please share! Pictured below: cleaning products the kids ordered from Grove. I can’t believe anyone would comment that you should be thankful to clean up after a husband and kids. No way! I have two very littles (almost 3 years, and 6 months) so I am not at the point where I can really make them do chores yet but I am bookmarking this post for the future. My husband over time has really taken on more housework (we’re not 50-50 but it’s definitely better than 90-10) and I am very appreciative of that. 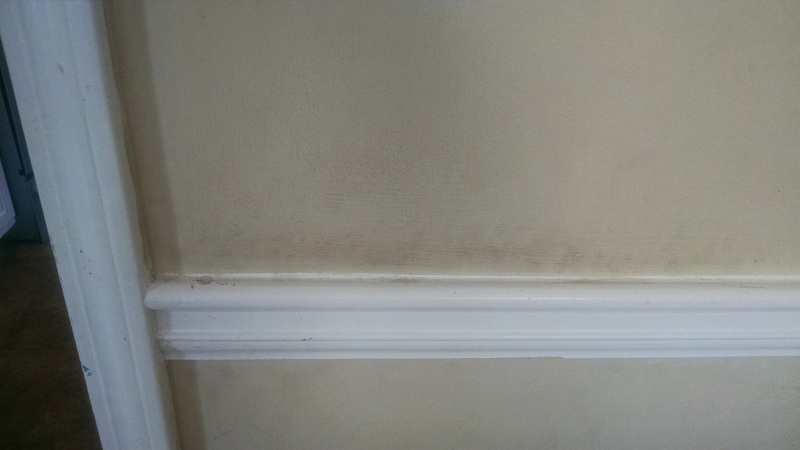 We also recently moved into a house that was meticulously cared for and we are working to keep it that way. It’s a challenge for sure. I have found that some kids are better at other chores than others so we’ve appointed those to the appropriate children and that has helped. They also knows exactly what is expected of them because I’ve typed out or shown them multiple time. Keep up the good work! Kristen, very true. In fact we have let our kids choose what chore they do, it makes it far less of a drudgery for them. And you’re right – we do have to show them multiple times! So easy to forget how much repetition it requires to train a child. Maggie I have had that before, trust me, which is why I wrote that little preemptive strike. LOL! This is my house too. Homeschool 6 kids with a baby due in 6 weeks. No teenagers, though. But the older kids (11 and 9) can do quite a bit. 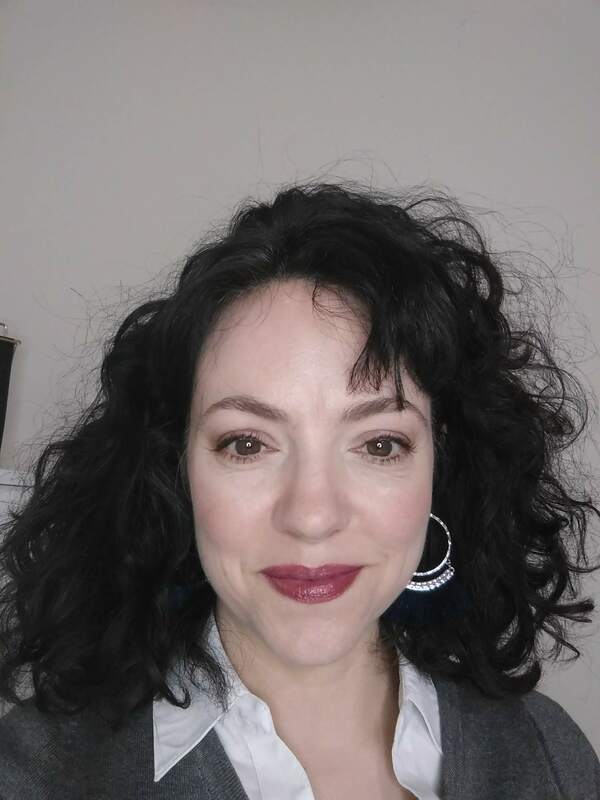 I teach the kids how to clean and they are responsible for one group room and their bedrooms (shared of course, so half the work) I appreciate the tips you have here, I’m glad I’m not the only one who has to clean up theee times a day- I thought we were just super messy. Great tips! It is hard when you homeschool and there are kids running through the home all day. I have the same goal this year of getting my house in tip top shape. Wishing you much success! “Messblindness!” Yes! I’ve sprained my ankle and I’m supposed to stay off it. My family is helping in a lot of ways, but somehow it was no one’s job but mine to wipe the kitchen counters…. Even now they don’t see it, but we are working on it!!! The kids HATE the idea of cleaning up each other’s mess, so we long ago had to find a “fair” way to divide the work. 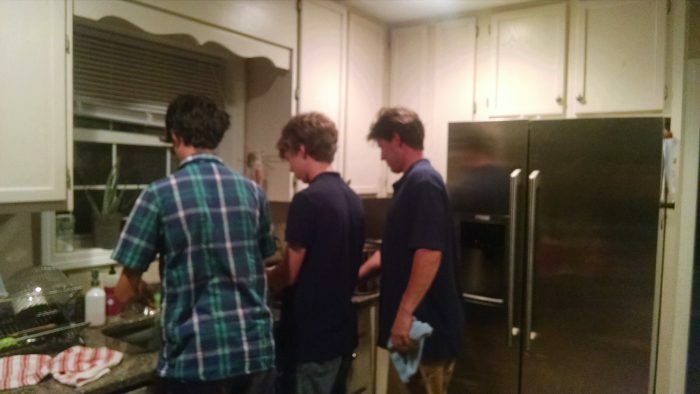 Each has an assigned day to clear the shared dinner dishes and wash the table. Maybe its a messy meal, maybe its not, but it evens out in the log run. Maybe we’ll need to extend that to the kitchen counters and lunch time … At least until I’m. Ack on my feet. Or not! ?? Cleaning lessons are so important! My mom would repeat the lesson and allow the offender to have plenty of solo practice if the job started to be done poorly. DS is only 3, but we are starting with a few things he can handle. What an interesting topic and perspective. I sympathize with you regarding the coffee splatter on the white risers (My husband also manages to affect spillage on the bathroom door??? What the what??). I have had a house keeper for years now, until this past year when my son turned 13. I made the conscious decision to sacrifice my comfort in order to teach him important life skills, such as how to properly clean a toilet. Like you, I am exhausted (I’m crashing towards 50, have a stressful job — Pediatric Cardiac ICU RN and ECMO Specialist, and I homeschool my son); however, watching Jack take on certain additional chores and improving his performance has given me little bursts of energy from my pride in him. Albeit, I do miss my house faeries ;). Mazel Tov on the new home! I just printed out a fabulous 12-month home cleaning/organizing calendar because this is a big goal for me too this year! Good luck! The clean up activity that works best at our house is Drop Everything And Tidy (aka DEAT) which is when we all return everything that belongs to us to our rooms and then set the timer for 10 mins and manically tackle a job – clean the kitchen, bathroom, vacuum as many rooms as we can get around etc. It works best when everyone works together so with 7 children you can get 70 mins worth of chores done in 10 mins – even the toddler can do something – wipe the skirting boards with a wetwipe for instance. Sometimes people are not around during DEAT time and need to catch up – so in 20 mins a teenager could unpack clean and repack the fridge etc. We use magnets for our dishwasher duties with the children’s initials on them – they have 4 each. I put on 2 per day and they do their stacks and unpacks when it suits them. 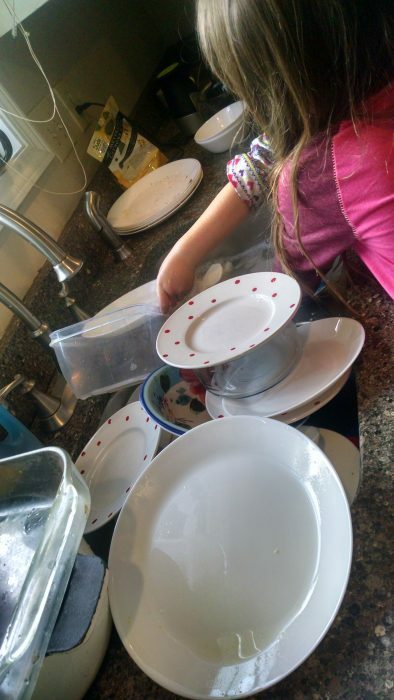 Like you I don’t like dishes piling up so if they don’t deal with them and they run out of magnets then I do it and they have to contribute money to our retirement fund – no recriminations or nagging. @Corey – Yes, spills on the bathroom door, I’ve seen those too!